For most of my career I was the lone female sprint cyclist on the national team. Sure, I was following the footsteps of world champion Tanya Dubnicoff and Olympic champion Lori-Ann Muenzer, but they were long gone and I went to the track each morning to train solo. I learned to make friends with the endurance group — that weird “other” type of athlete who likes to go slightly slower, but for longer, and with more pain. I never had that in-house competition that so many athletes credit for their success. After qualifying for, and competing at, the Olympic Games in London, I had used up all my matches. The two-year qualification process, with 12 races, each one being The-Most-Important-Race-Of-My-Life, took everything I had and even though I had the performance of my life in London, when I made the keirin final, I decided to hang up my bike. I was tired, yes, and I wanted to finish school. But more than that, I had a deep feeling that my work as a cyclist was not meaningful. I was responsible for a lot of my day-to-day coaching since my coach lived out of town; I was thinking about myself all day and how I could be better, with no emphasis on anything bigger than myself; and I had a feeling (made up or not) that I didn’t quite belong...that I wasn’t quite good enough to be making an impact with my performances. So I went back to school and got an engineering degree, in hopes I would find more meaning there. 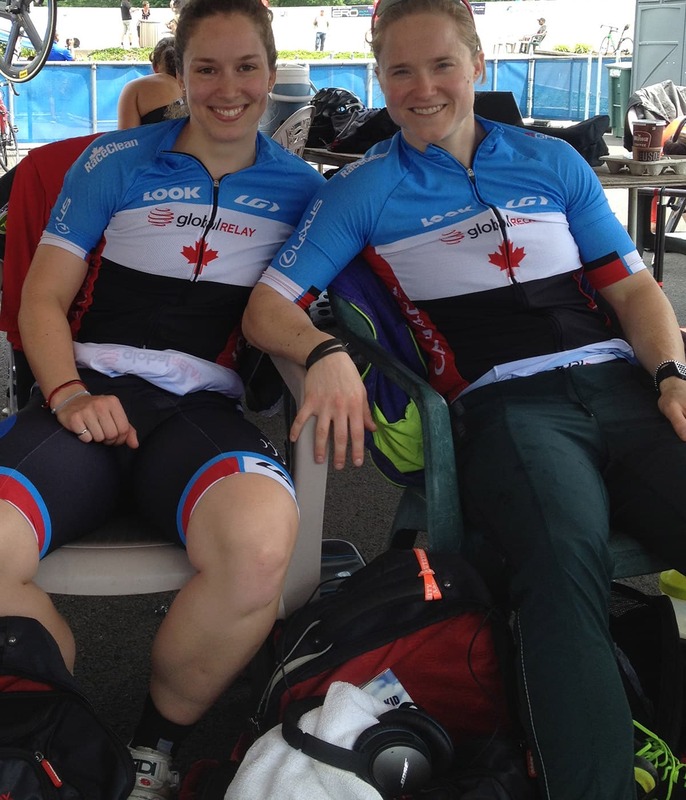 In 2014 when Cycling Canada hired a full-time sprint coach for the first time in many years, I was pulled back into the program. But this time, it was different. Kate O’Brien, a boblseigh athlete who narrowly missed out on the Games in Sochi due to injury, was identified by a talent ID program at about the same time. Kate had posted the largest power numbers we had ever seen. For those of you familiar with riding, she busted out a peak power of 1,350 watts on her first try on a stationary bike wearing running shoes. This girl was legit. Suddenly I had a teammate and everything was about to change. Training with someone was so incredibly fun and we very quickly found that we both had expertise to share with the other. I was the cycling expert, and Kate was a speed and strength powerhouse. While I showed Kate how to spin, she taught me how to lift. While I taught her how to ride slowly along the top of the track, she showed me how to eat like a sprinter. While I explained how a match sprint works, she was showing me how to throw med balls. Along the way we developed a great friendship. Now don’t get me wrong, this having-a-perfectly-suited-teammate-situation is not all sunshine, butterflies, and rainbows. Having a teammate that pushes you every single day to be the best version of yourself is awesome, but in real life it also translates to “being uncomfortable all the time.” Every single day our weaknesses are pointed out and we are asked to be better. It is what drives us, and it is what makes us better. We compete in three events: the team sprint, where we get to compete together, and the sprint and keirin, where we compete as individuals. This sometimes creates a bit of a tricky atmosphere where we’re on the same team, and also, sort of not. It didn’t take very long for Kate to start beating me at training and then at races. Since this past spring, we have often been neck in neck on the track, and there have been stretches of time when there was not one thing I could do better than Kate. Every single training session it seemed she would beat me. Here I was, with almost 15 bloody years of riding in my legs, and along came Kate, who after 12 months of riding, was already finishing ahead me. She could, and did, transfer her skills from bobsleigh to cycling very quickly. This is where things got tricky. I learned just how competitive I really am, and yet I was so proud of the work she was doing and wanted to see her doing well too. Here is a girl who has never once backed down from an effort no matter how sick she was and who never shied away from sharing advice that made me a better athlete. If we both help each other as much as we can all through the training season, if we both focus on our performance and do the very best we can, then come race day, we will both go to the line as prepared as possible. Then we let the chips fall as they may. I decided to try thinking that the results would take care of themselves. Sometimes I would win and sometimes Kate would. When I lost, the disappointment would teach me and serve as a motivator. When I won, it would serve as a nice reminder that my hard work and training was going in the right direction. I learned to trust the ebb and flow of competition and that you really are not in control of the outcome. It took some time to adjust, and trust me, this dynamic is necessary to make our team work. It’s how we went from essentially beginners in the team sprint to qualifying for the Olympic Games in just two years. And yes, Kate is still new here, but she brought with her years of training from bobsleigh. I never let myself dream that I would race alongside a truly world-class competitor and now I do. Now when I go to work in the morning I know that if I am not bringing my very best self to training, I will be letting both of us down, and this gives me stronger motivation. More importantly, I feel part of a team working on something bigger than just me, and I like that. There is no one who understands our job and the stresses that come with it better than we do, and as we prepare for Rio, we rely heavily on each other. There are lots of very special days leading up to the Olympics. Days when I just can’t believe I get to do what I do. There are a lot of hard days too. Days when what is being asked of me feels completely impossible and I can’t see how I will get to the end of the day. Kate has been there for all of those days, and has helped enormously to get me through them. I am so grateful that we will be together at the Olympic Games for the good moments and the hard ones, and I know it will bring out the best in me. I can only hope that I can do the same for her.